All matter in the universe is comprised of fundamental particles. So what exactly makes up this matter? All matter is made of fundamental particles that came into being at the birth of the Universe. Quarks experience the strong force which is carried by massless particles called gluons. They bond together in specific combinations to form protons, neutrons, and other hadrons. Leptons do not experience the strong force but may interact via the electromagnetic force, the weak force, or both. 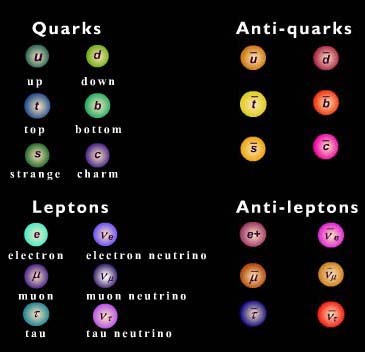 Anti-quarks and anti-leptons are exactly the same as their quark and lepton counterparts, but have an opposite charge. All massive particles are influenced by the force of gravity. At around 10-12 seconds after the Big Bang, the Universe is a hot mess of "plasma soup" with essentially equal parts matter and antimatter. Click "Play" to see how matter is turned into energy. When a particle and its antiparticle collide, their mass is converted into pure energy during an explosive annihilation. This process can also be reversed to produce a particle-antiparticle pair from pure energy. It takes more energy to produce a particle-antiparticle pair than it does to annihilate one. When the Universe was young, there was energy everywhere, as evidenced by the higher temperature. As the Universe expanded and cooled to its present state, the amount of free energy dropped below the threshold necessary to produce pairs. More energy is required to produce a particle-antiparticle pair now than in the past due to a decrease in available free-energy. Now, more particle-antiparticle pairs are being annihilated than created.